It’s not long now until our fabulous pantomime Cinderella opens! To get you into the panto spirit have a go at playing our Cinderella pumpkin game. See if you can avoid the pumpkins, collect all the fairy dust and have your name at the top of the leaderboard. Have a slippertastic good time playing the game and don’t forget that if you forward the game on to a friend you will be entered into our draw to win a family ticket to see Cinderella. What could be better than that? 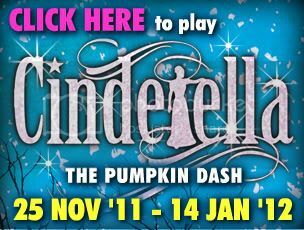 Cinderella runs from Friday 25 November 2011 – Saturday 14 January 2012. You can book tickets by calling our Box Office on 0115 941 9419 or by visiting our Cinderella page.